This week I met with a client who has wanted to redecorate her living room for over a year, but hasn’t been able to make any decisions to actually move forward with the project. As part of her new year’s resolution to finally be able to enjoy the space, she recognized a need for assistance, and that’s where I came in. Meeting for the first time, she had a file folder filled with magazine clippings, paint swatches, and a list of ideas for the space. I prefer when clients have carefully thought about how they want to use a room and what their overall vision is. However, in many circumstances, over-thinking can lead to everything staying the same for long periods of time, all for the fear of making a mistake or a wrong decision. Making decisions on a whim is never a good idea when it comes to decorating, but taking too much time to ponder can be even worse. After seeing the space, gathering the information I usually require on a first visit, as well as looking through the contents of the file folder, I was able to get a pretty good sense of what she’s after. 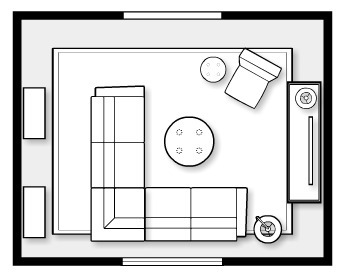 We’re meeting next week to go over the plan, and I’m confident she’ll be enjoying her new living room in no time. Sometimes all it takes is fresh eyes to put it all together and come up with a clear vision for the space- a plan to get from A to B (or Z depending on the scope). If you’re experiencing a standstill when it comes to a decorating project of your own, there are a few things you can do to start to move forward. 1) Gather your tear sheets and photos and go through each one jotting down what you like about the room in particular. As an option, you can create a board on Pinterest and make notes under each photo. 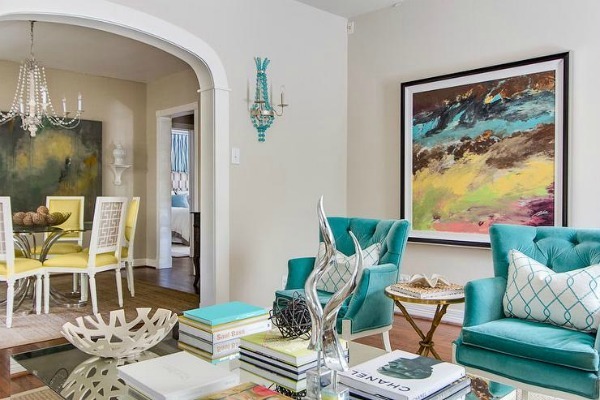 2) Group your points into categories, such as Window Treatments, Accent Colors, Furniture, Accessories, Artwork, Lighting, Architectural Details, etc. 3) Determine commonalities within each category. In this example, I noted purple and pops of color. 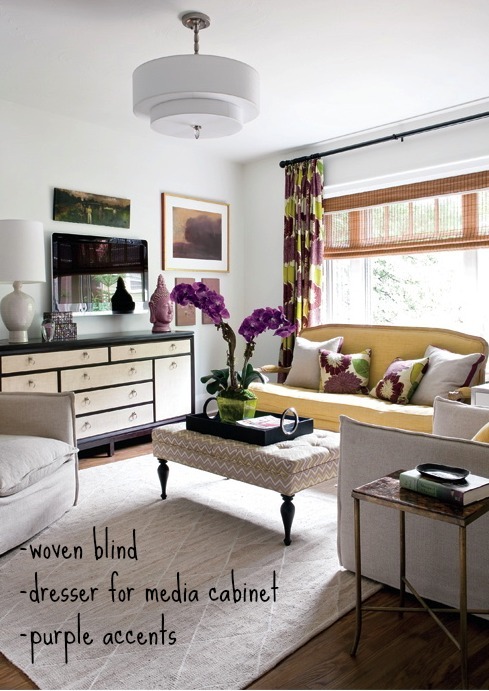 This says to me that I want some variation of bold color in the decorating plan. 4) If you’re still having difficulty determining certain features, glance over the photos one more time. Are the walls a light neutral in most of the photos? Is there a statement light fixture in many of the photos? Are the area rugs subdued or heavily patterned? These are good indicators of which direction to go in. 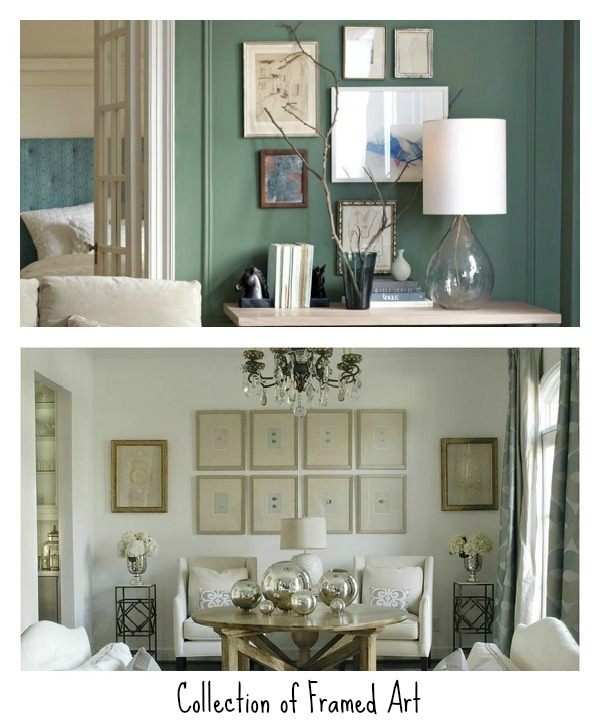 Here are two sample photos showing a gallery wall as the common thread. This is something I would want to work in to the decorating plan. 5) Determine what you can tackle on your own and what you need to enlist help for. Perhaps you are confident in selecting furniture pieces yourself, but you need a designer to develop a good space plan. Are you able to paint the walls, but need someone to help finalize a color? Knowing what you require assistance with and what you can carry out yourself will save you money in the long run. 6) Set a timeline and stick to it. Quite often rooms get 80% finished and the last 20% takes years or never gets done. If money and time are the main issues (as they usually are), break your plan up into stages, such as fixed elements (flooring, trim, built-ins, sconces, etc. ), main furniture pieces (sofa, ottoman, chairs, side tables), and finally, accessories (pillows, artwork, etc.). Where do you tend to get stuck in the process? Are you able to get started but give up part way through? I’d love to know your hurdles! I’m totally doing this! I have been pulling stuff from magazines and have a pinterest board for my bedroom, but I can’t seem to narrow the look down. I may be in touch if I need you to look it over and help me come up with a plan. Such a great post Shauna! I have been thinking about redoing our main family room for about two years, and I see myself in this post. :-) I have a box full of magazine clippings…think it’s time to go through them and decide what I like. Thanks Renee! I hope this process works for you and you’re able to finally redo your family room- I think this is the year for finishing projects. Great tips! I’ve kind of been doing that with my Pinterest boards lately, and it’s interesting to see what stays and what goes! Pinterest has made the process of collecting images and reviewing SOO much easier!!! I love to do this and reference all of these images before I make a decision on a larger purchase. In fact, I wish Pinterest was around sooner……we purchased a huge area rug for our living room a few years back and it just doesn’t seem to fit our space anymore. We went for comfort and practicality (dark because of the boys) and I’m so craving something white and light! Ah….I’m considering layering a rug over it…. 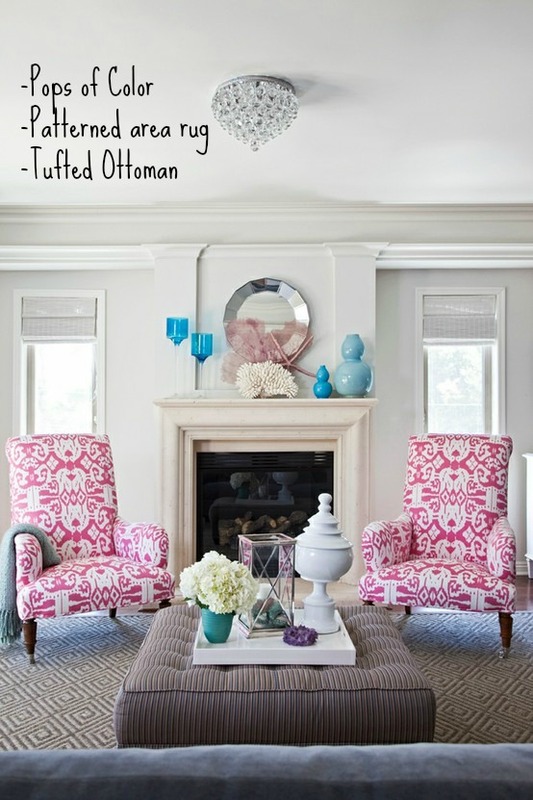 I also love that patterned area rug above…will have to pin it for that “some day”! I agree that Pinterest has made this so much easier. Not only can you see the photos side by side, but you can easily delete them if they’re not looking quite right with your vision. I think we’ve all made purchasing mistakes. A couple years ago I stopped selecting items for our home based on practicality and price. I have a chocolate brown leather ottoman that we haven’t really liked since day one that was based on those aspects (kind of like your rug). I think a slip cover may be the next step! I usually find that clients have an obvious direction based on the tear sheets without even realizing it. It’s so rewarding to help them see what they know inside but don’t have the words for, isn’t it? Great tips Shauna! Shauna, I love number 5 because that’s the hard part and what people get stuck on.. What can you tackle yourself and what do you need help with? I love all the inspiration photos and yes, let’s make this the year that our projects all get finished!